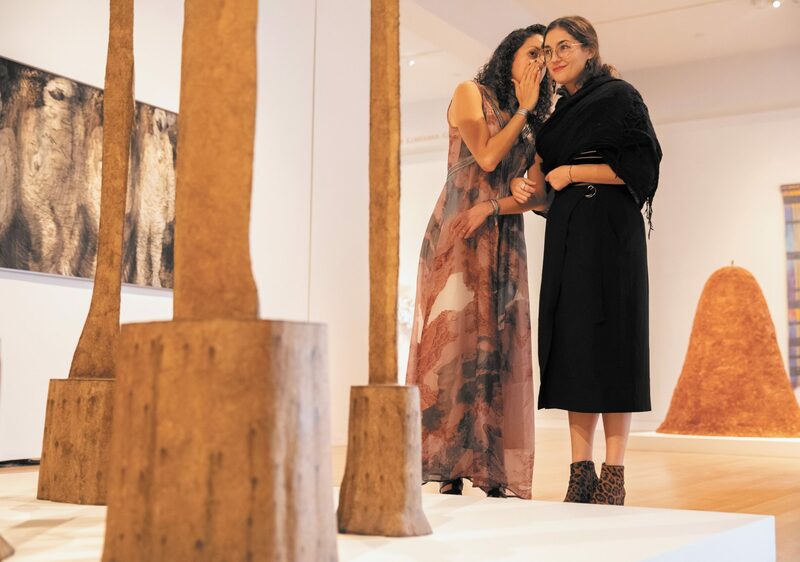 Artist Cristina Molina, at left, delivers a “whispering tour” to Amy Crum in the exhibition Ear to the Ground: Earth and Element in Contemporary Art. At select intervals throughout the run of Ear to the Ground: Earth and Element in Contemporary Art, on view through August 31, New Orleans-based artist Cristina Molina will host a series of performances in the exhibition’s galleries in, which she offers museum visitors intimate guided tours of the exhibition. Can you share more about the inspiration behind these performances? The performance is called Under Three Things. In this piece, I want to transport museum visitors to the underground, or underworld. I assume the figure of Persephone from Greek mythology, but reimagine her not as a victim of Hades, but rather as an empowered goddess with her own agency and strength. In the performance, I offer visitors guided tours of the exhibition in which I mingle real facts about the artworks and artists with my own fictional narrative, mixing up what people are seeing in reality with this imagined, fantastical landscape. I want the experience to be as immersive and intimate as possible, which is why I whisper to people, and only do these tours one on one, arm in arm. I want people to come away with a very different experience of the artworks than what one typically gets at a museum. You often privilege female protagonists in your work. The photograph that you created to accompany your performance, on view in the gallery, is nestled among work by other female artists. Is that something you were thinking about? I don’t think it’s exclusive to women, but do I think this exhibition really demonstrates that women have a certain special sensitivity to the landscape that really resonated with me. When I guide people through the exhibition, and we are looking, for instance, at Olafur Eliasson’s work, The Hinged View, I talk about rainbows. His work is very much a nod to gender equality, and also a way to encourage people to think about non-heteronormative ideas. Were you thinking at all about the environment and the potential threats of climate change when you created this tour? Yes, definitely. It’s very subtle. In all of my work, I want to seduce people, draw them in, and offer them this illusion of softness. But then, every once in awhile, I break the illusion by jarring them into a reality they may not be expecting. The title Under Three Things is taken from the biblical Proverb, “Under three things the earth trembles, the fourth it cannot bear.” My performance is, in part, a meditation about the danger that the earth might break under human exploitation. You’ve mentioned previously that your work often deals with the search for paradise. Do you view this performance as seeking a kind of utopia? The tour itself isn’t exactly about finding a utopia, but instead is offering a new vision of it. I want to reimagine the underworld not as an endpoint but as an arrival. In today’s current political climate, when there are so many issues that are so vocal and visible, we need a place to stop and think, and that is the space I am trying to create. What do you want people to take away from the performance? What I hope it offers is a space to slow down, to really look and really listen. I hope that people really consider my slow pace and soft voice, and maybe bring that same energy to looking at other artworks in the museum, and into their own lives. Curatorial Intern Amy Crum is a graduate student at Tulane University. She interviewed Molina after the first performance. Friday, January 25 | 6 – 8 p.m.
Friday, march 22 | 6 – 8 p.m.
Friday, april 5 | 6 – 8 p.m.